CCI Wireless recently jumped at the chance to “double down” the service levels in our flagship Wi-Fibre town, the Village of Caroline! We still offer three packages, but each has twice the speed – both upload and download! Of course, every CCI package always features unlimited data, as well. Our best package ever consistently offers speeds up to 100 Mbps download and 10 Mbps upload. A Wi-Fibre connection puts our customers one step away from fibre, giving the fastest and most reliable internet possible in town. It’s a great accomplishment to offer this to a town of “only” 150-ish homes, where an expensive “fibre-to-the-premise” solution isn’t viable. There is no price increase on the doubled plans, as it’s our mission to us to keep internet solutions as accessible to rural Albertans as they can be. Caroline is our our pilot community for Wi-Fibre systems, supporting the development of next generation capabilities for rural Alberta Since we finished construction in 2016, this is our third iteration of the Wi-Fibre solution as we strive to deliver fibre like experiences across Alberta. 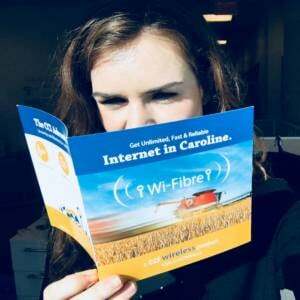 Now, it doesn’t matter where your home or business is within Caroline, we guarantee that you can be connected to our best plan ever. In the near future, we will be expanding our Wi-Fibre solution into new areas in Alberta. If you are in Caroline, keep an eye out for more “double-down” promotions in late October! If you are a pre-existing Wi-Fibre customer, your connection was upgraded to your new plan automatically in September 2018. Please get in touch if you have any questions about your service. If you’re a councilor interested in a Wi-Fibre project for your small Alberta town, send us an inquiry. Wi-Fibre is a powerful, localized version of our classic wireless internet. We’ve combined the power of fibre with the versatility of wireless towers, showing that small-town Alberta can affordably access scalable, city-like speeds. Four lamp-post sized towers throughout the Village of Caroline allow each and every resident to reliably connect to any plan, up to 100 Mbps download. In 2016, the CRTC declared internet a “basic service”, with the goal of 90% of Canadians having the option to subscribe to internet service speeds of 50 Mbps download and 10 Mbps upload, before 2022. This is particularly challenging in rural areas with low-density or small populations. CCI is very proud to have easily exceeded these aims early, with our Wi-Fibre solution. We are striving to meet the CRTC-declared service standards across our network. We are offering 20 Mbps wirelessly in many areas, and these plans will be available more widely in 2019. Eleven towns offer up to 50 Mbps download through our CCI Wired solutions.